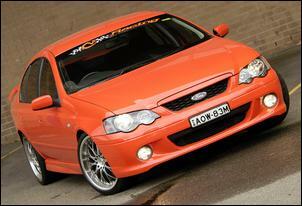 If you still need convincing that Ford's XR6 Turbo is king, here it is! For many years the Australian high-performance scene has been dominated by the Subaru Impreza WRX. But if you ever needed proof that there is a new performance king on the scene, this is it! Let's take some time to think about the numbers associated with C&V Performance's Ford XR6 Turbo. First, it has made 385kW at the back wheels. That equates to around 500kW at the engine or, to put it another way, about 50 percent more power than the current 8.0-litre Dodge Viper... Muscle car? 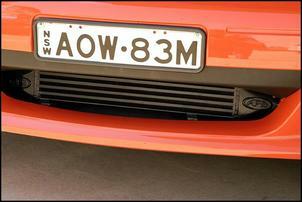 You must be talking 4.0-litres of turbocharged six! Second, with no other track preparation apart from a pair of rear slicks, the car has run a best quarter mile time of 10.9-seconds at 124.7 mph! It's so fast that the racing officials won't let it run again without a roll cage! Oh, and we'll fill you in on one other important little titbit... Since running this time, the car has been further tweaked to pump out an extra 20kW at the wheels - bringing the total up to 405kW ATW! Con and Vic Elfes of Sydney's C&V Performance are drag racers from way back and they've run more than enough tough cars to know what's hot and, well, what's not. The XR6T, they say, represents a new era of performance. Ford really has set the benchmark. Regular AutoSpeeders might recognise this car from our previous road/dyno test of the APS (Air Power Systems) XR6 Phase III power-up kit – see APS Phase 3 Teaser. In short, we were blown away by the sheer grunt, drivability and integration. Con from C&V explains that their orange XR has been serving as one of APS's many in-the-field development vehicles. He recalls the standard car (with an auto trannie) managed low 14s over the quarter. Not bad, if you ask us. But progressing immediately to the APS Phase II kit (comprising an upgrade exhaust, air intake, replacement injectors, additional fuel pump and UniChip) the car plunged into the high 12s with a peak boost pressure of just 10 psi. That, as Con says, is more than enough performance for the average enthusiast – a 12-second car rarely gets beaten on the street! The next stage of development involved stepping up to the Phase III kit and pushing it as far as it could go. Moving up to Phase III means adding a replacement wastegate actuator and a DR-series front-mount intercooler that's approximately 4½ times the volume of the factory intercooler. 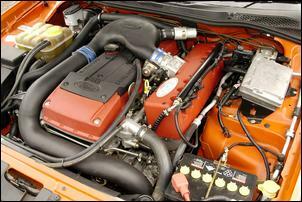 With such effective charge-air cooling, C&V cranked the boost up to a massive 22 psi. This combines with the existing 3½ into twin 2½-inch stainless exhaust, cold air snorkel, upgrade fuel system and UniChip. Oh, and the APS optional blow-off valve was also installed at this time. It's nothing excessive but, believe it or not, this is the exact mechanical configuration that was used to make 385kW at the treads and to run a 10.9-second ET. That makes it the fastest XR6T in Australia. And don't bother looking for a nitrous kit – there ain't one! After changing to the Phase III APS kit the C&V XR6T ran into valve spring problems. Con explains the valve springs fitted to certain examples aren't capable of controlling the valves at high boost pressures. This was solved by installing replacement OE springs, which apparently share a Ford V8 part number. 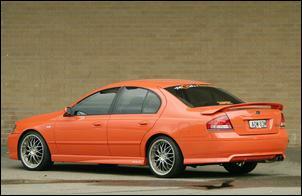 C&V have been developing the auto transmission in their orange XR6T for some time. Con recalls the standard trannie gave trouble even before the car was modified... Since then, C&V have been testing various mods and are pretty happy with the current set-up. The transmission internals have been heavily revised in conjunction with Northmead Auto Centre and an all-important trans cooler has been added. "We give our cars a pretty hard time and the current set-up is coping well – it all looked nice inside when we last dropped the gearbox for inspection," says Con. There have been absolutely no problems with the standard rear-end. Content that they'd cracked a 10 with the Phase III kit, Con and Vic have recently switched to a yet-to-be-finalised APS Phase IV kit. This adds a beautiful new intake plenum with the original set of six injectors now employed as secondaries – waste-not want-not! 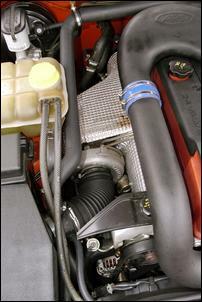 The pre-turbo induction path is also revised as part of the upgrade. 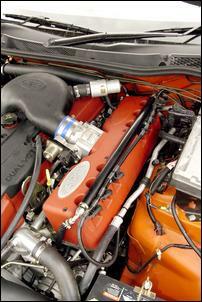 This involves relocating the battery to the opposite side of the engine bay and fitting an APS airbox to the space now available in the driver's side guard. "We're still using the standard turbocharger," says Con. "I'd like the rev limit to be a couple of hundred rpm higher – especially if we go to a bigger turbo – and it would be nice to be able to control the electronic throttle. It'd be great to have control of the throttle during gearshifts," he says. "I'm sure that sort of thing is on its way from APS." Even as it stands it's safe to say the Ford XR6 Turbo is a milestone vehicle. In Con's words, it's simply "unstoppable!"